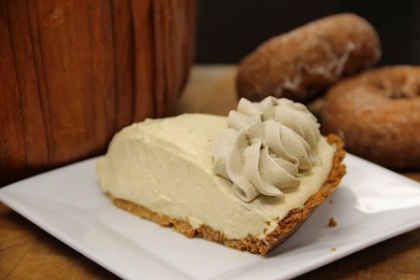 Culinary Corner: No-Bake Pumpkin Pie with a Donut Crust! For me, fall means two things: pumpkin everything and pie. Growing up, my Mom and her five best friends would go out for pie now and then, leaving us with the Dads for the evening. Before long, we caught onto their game and the "Pie Girls" as they called themselves became the "Pie People." To this day, our six families gather for holidays, major life events, and milestones to celebrate with what else, but pie! Over the years I have grown to love pie more and more, which leads me to today’s recipe, which is simple and perfect for the fall, No-Bake Pumpkin Pie with a Donut Crust! We’ve paired this recipe with our Dark Roast whipped cream, making this a non-traditional coffee and donut combination. From my family to yours, enjoy! Preheat the oven to 350 degrees and press the crumbled donuts firmly into a pie pan. Bake the crust for 15 minutes, then cool thoroughly. In a bowl, combine the cream cheese, pureed pumpkin, powdered sugar, and spices until smooth. In a separate bowl, whip 1 cup of the heavy cream to soft peaks and fold into the pumpkin mixture. 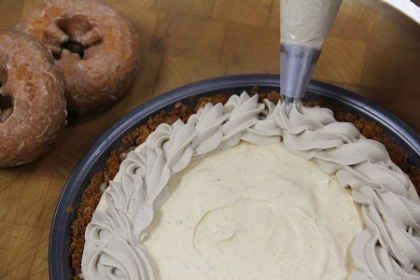 Pour the pumpkin cream mixture into the donut crust and smooth out with a spatula. In a microwave safe bowl, combine ground Dunkin’ Donuts Dark Roast with 1/4 cup of heavy cream and heat it for 30 seconds in the microwave. Strain the Dark Roast out of the cream using a coffee filter and set aside. Whip the remaining heavy cream in a bowl and once it reaches soft peaks, add in the Dark Roast cream. Pipe the cream onto the top of the pie and enjoy! Share your #DDPumpkin creations with us on Facebook, Twitter or Instagram! For more ideas and tips on cooking with Dunkin’ products, check out more recipes here!